It would be safe to say that I am beginning to get cabin fever. I am still in Florida, getting things squared away with dad, and in the evenings I find myself getting so bored. One can only watch so much Netflix or Amazon. Hulu I have to watch on my laptop and I’m usually on my laptop. So by the time I go to bed, I read for a bit and then fall asleep. It’s odd, I seem to sleep better when in Florida, compared to Indiana. Weird huh? Every year I plan to make an afghan a month or so, and by Christmas, I will have beautiful afghans to give to my family. Heirlooms they can have and keep when I am long gone. I’ll start the year off with good intentions, but I never finish the afghan. Or I’ll get several afghans made, but never actually finish the afghan. My Granny showed me how to make a chain, and how to do the single stitch. But that what all. The rest I learned on my own. I have so many blankets, but except for 2, I’ve never finished them. I honestly don’t know the correct way to finish a blanket. So, I am starting all over again. Beginners crochet and I’m inviting any and all of my readers to join me. 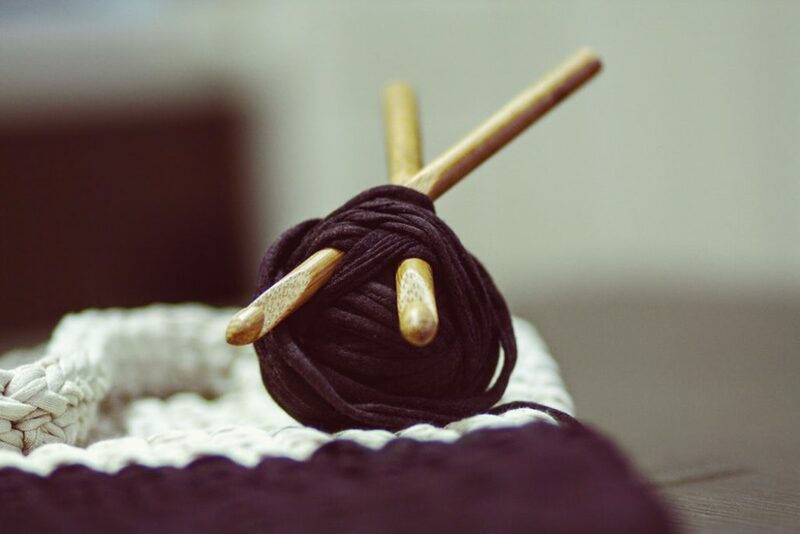 Whether a refresher course because it’s been a while since you crocheted, or you’ve always wanted to learn. Let’s do this. Together. I did a search for beginners crochet on Pinterest and omg, I found more than a treasure trove of beginner tutorials that came up. There were so many beginner tutorials and free patterns. This was when I decided it was time for me to re-learn to crochet so that I could actually start and then complete what I had begun. I have so many blankets that I have not finished, I wasn’t truly sure how one ends an afghan. So they are stored, just waiting to be given as gifts. Are you willing to join me on this new journey? If you have any questions, help, links, patterns, etc, please leave them in the comments below. I don’t feel knowledgeable enough to teach anyone, and because of my arthritis, I hold the crochet needle different than they show. But I already know the three basic stitches, single, double and treble. So if you are starting out a fresh-a total newbie, and don’t know any stitches, please check out the video below. You will need to learn how to crochet a chain and this video covers that as well as a single crochet stitch. If you know these basics, please feel free to skip to the throw tutorials below. I’ve posted tuts, for both left and right-handed individuals. When we’re done with the above tutorial, we will have a dishcloth. I’ll stop for now, give everyone a chance to become comfortable with making a chain, and stitch. OK, so how did you do? We’re you able to catch on? I hope the tutorial above helped you and you were able to get your dishcloth made. I used mine as a potholder. My friend made a longer version, and it is what she sits her dog good bowl and water bowl on in the kitchen. Do you feel comfortable enough to move on? If not, no rush, go at your pace. Once you feel comfortable with making the chain, and doing the single crochet stitch, then you can move on. Update: 2/6/2019 After completely watching Mary’s throw tutorial below, I realized we needed to know how to crochet the double stitch. 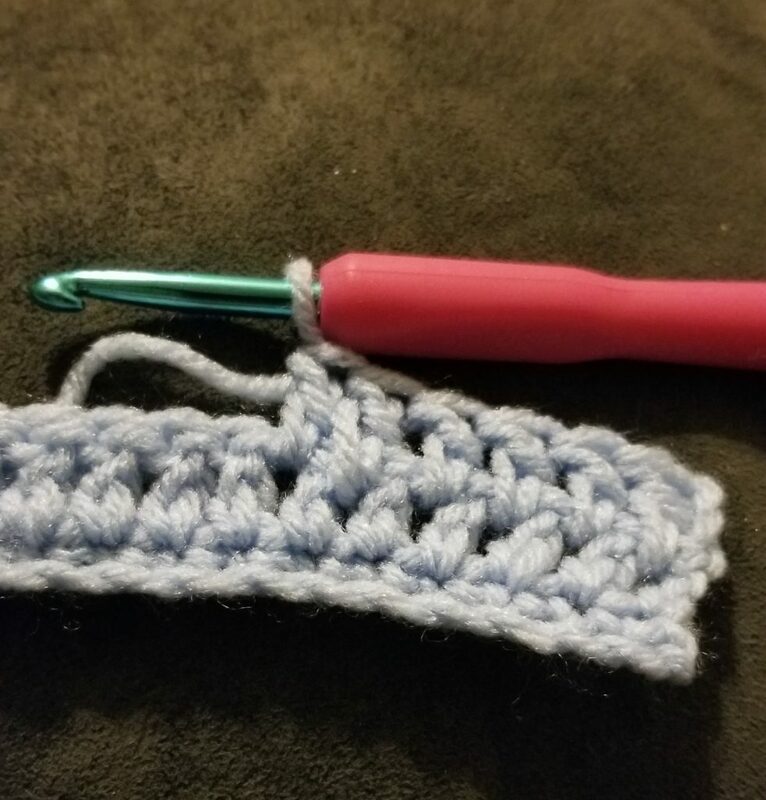 So I am adding a tutorial for the double crochet. I was unable to find a tutorial to make an afghan in the single crochet stitch only. They all seem to start out with the single crochet for the first row, and then double crochet on the following row(s)! 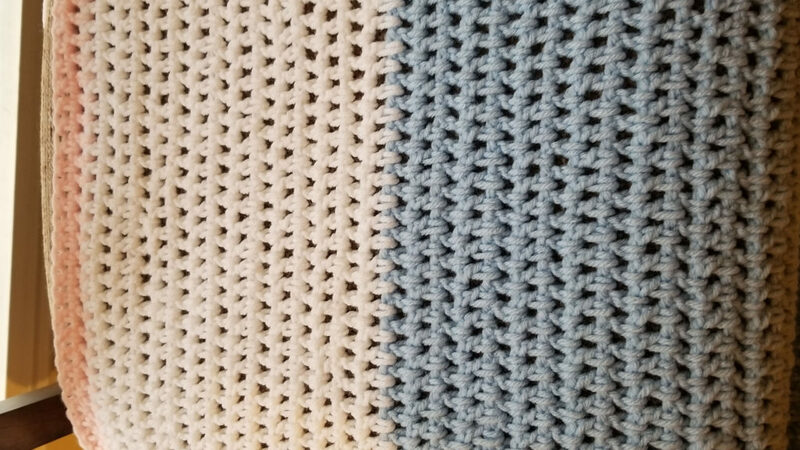 IF you happen to find a single crochet afghan or baby blanket tutorial, we’d all love for you to post it in my comments section below. And thank you in advance! But I Want to Make Something! Ok, I searched all over YouTube for a beginner, single crochet, blanket. Please keep in mind that there is more than one way to make your chain. If you prefer to make your chain in the video above, by all means, do so. If how the gal does it in the tutorial below feels more natural for you, then do it how she does. What works best for you is key here, k? I have to hold my hook different than what is taught because of my arthritis, but I still get the same results, and in the end, that is all that matters. Are you ready to begin our first project? I am! I buy most of my yarn at Walmart for most projects, and to begin with, I’d suggest the Red Heart yarn that they carry. If you too suffer from arthritis might I suggest to try the hooks that I use, and they can be found here. This tutorial is for those that are right handed, by Marly Bird!! 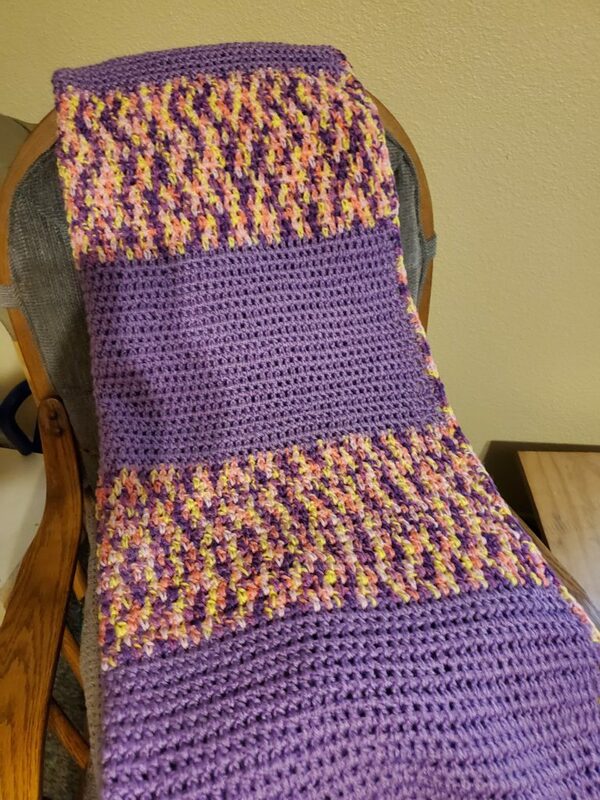 I beg of you to email me a picture of your completed throw, and I will post it here! Please, email me your pictures at LCEndahl@gmail.com and thank you!!! Saturday, February 9, 2019: Ok, everyone, I’m sure y’all are way ahead of me, but I’ll be the first to post what little I’ve got done. I do want to mention that I am not using the chunky thread, nor as big a hook as Marly, I just used something I already had. This will be my first blanket, done as shown, step by step, and this will be a blanky for my Mojo! You can find Marly Bird’s website by clicking here. I’m really beginning to like this gal, she’s an awesome teacher, and she’s so sweet, I just like her! Thanks, Marly, for your wonderful tutorials for us beginners! I thought I’d update everyone. I am finally getting some crocheting done. Unfortunately, it’s by my dad’s bedside in the hospital. This is also why there hasn’t ‘t been any new articles from me, but I will be working on that soon. I will also get a post up of my progress on my throw ASAP . I finally got a chance to take a pic. I’m using the yarn I had on hand. And remember it’s not chunky yarn, nor the size hook she suggested, but I am following Marly’s tutorial above. Oh, that is wonderful news. We’ll all take warm memories any day, right? When you complete a project, I would love for you to take a picture, and send it to me so I can post it on my blog. I bet it’ll look great. Bet it came right to ya! What an interesting article, thanks for taking the time to write it. I enjoyed it particularly because I grew up watching the women in my family working on their creations and sharing them with each other. I personally never thought of taking up this activity because when I grew up this was seen as a strictly female activity. Things, of course, have changed and now I’m not sure that I’d particularly care what anyone said, were I to give it a try. Thanks again for presenting the topic for those with the desire to explore. I’m happy you found my article interesting. Makes me feel good. You would be surprised the number of men crocheting these days. Some with YouTube channels. I hope you g9ive it a shot!